Aharon, I truly respect your productivity. But we need to face the fact that in real accounts, where your and mine money is in the line, we only get real ticks.That is, no OHLC bars with 4 ticks a timeframe whatever this timeframe might be. You may succeed in backtest on M5 OHLC timeframe, but in reality your EA will create loss after loss. Because of all the ticks that happen within that frame and that will generate signals over and over. This OHLC testing mode is just not fitted to sustain real life, I hope you can comply with that. Again, i ask you did you made a lot of money using every tick option ? I told you you can do whatever tests you want. You will have fine results! I think I've made my point clear enough and I'd encourage you to rethink your assumptions. Please do not counteract by posing irrelevant questions. I'm open to discussion per PM but I do not want to start a quarrel. Furthermore I ask you to be responsible and not try to track newcomers into this falsifying backtesting strategy. Whay money is irrelevant? this is the main subject. Whay do you insist not to understad ? i told you that you can perform whatever tests you want! and you will have fine results ! Do it by yourself! dont be lazy! Do not force anyone to do what you think is right, everyone will decide what is good for him without forcing people to do what you want. I must emphasize that everyone will decide for himself what is right for him without underestimating any method. Let us do one way or another, everything is free choice and that is your opinion alone. Some people will say that every thick is also falsifying backtesting strategy. Do not force anyone to do what you think is right. Everybody will decide what is good for him without forcing people to do what you want. I must emphasize that everyone will decide for himself what is right for him without underestimating any method. Let us do one way or another, everything is free choice and that is your opinion alone. 1) Of course it is. And so I ask you to be responsive and answer to my argument that OHLC contains prediction of the timeframe's future, that your EAs take advantage of. Do not counteract this with any elusive questions. Get your pencil and do the math! 4) yes, and anything is but a dream within a dream, as Poe said. 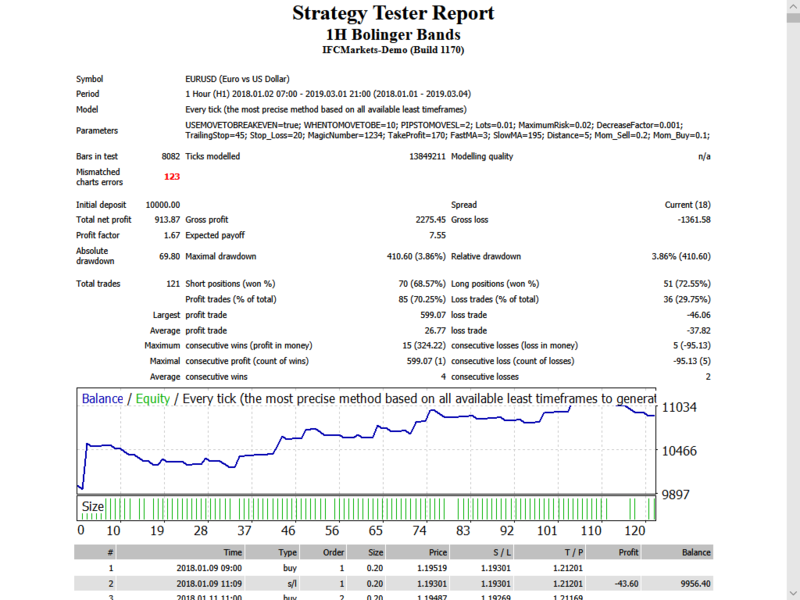 Get back to reality and test these EAs on a live account, then post some proof here... I reckon your ideas have great potential to be turned into profitable robots, but currently they are too coarse and just succeed in OHLC which is a fake mode if you trip on the high/low ticks. Again, I'm not wrong, do the math. 1.I told you that every method has its pros and cons,no thing predicts the future,i understand that you want to make money with the best method possible,and i understand that you did not made any money because you want to find the perfect method,there is no such. 2.people want one time parameters that will run all the time and do not want to perform back test or do not know to perform back test,they did not get good results because they did some thing wrong. 3.it is not up to me to perform back tests for you every day or every few days it is up to you to check and explore,if insted of arguing with me in that time you would have performed back test by you self you would have fine results. 4.I have poblished more then 60 EAs i can not give you live testing for all,i can only help you and give you the strategy and guidance,if some one is too lazy to perfom back test and run the EA for several weeks on live demo account then he shuld not work with EAs,remember that this is a service I give you for free,It's very rude to ask me to carry out your tasks. In fact i have poblished for free two EAs that run on live demo account and i test them with open prices only,I'm not allowed to talk about other products here so I can not mention the link here,you can look for it by your self. It took me a few days and then I stopped the test in the middle,started over agin today and i show you the first reasonable result that it gave me,the test never ended. I do not find any good sense to work with this method. There is no reason not to perform the back tests correctly when there is a training video ! If you need to learn to perform back tests,see the video ! You: "I told you that every method has its pros and cons,no thing predicts the future..."
And this where your assumptions go wrong. OHLC ticks do predict the future. To be more precise the High and Low ticks of each OHLC bar contain prediction of that timeframe's outcome. A realistic EA would not be allowed to take decision on these two ticks, but your EAs do and so perform better that would in reality. It didn't meant to be rude and I apologize should you have had any perception of being offended. You are publishing lots of code, but the EAs are always tested in this crappy OHLC mode and because of this in my opinion you are at risk not to be taken serious. That's why I wanted to confront you with my understanding of the mechanics. You are free to prove me wrong, of course. EA testing – why “open prices”? 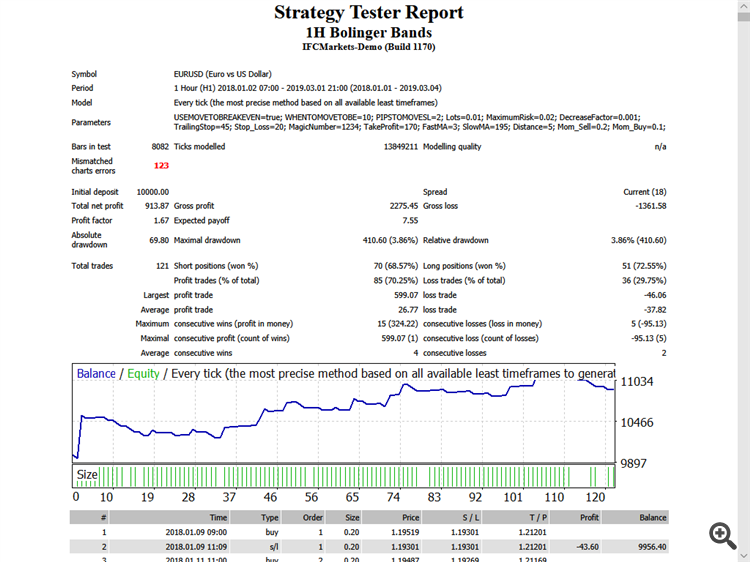 Statistically you have two options: the price goes up or down, the chance is 50% / 50%, you can not tell when it will happen, when you perform a back test with each tick module you basically rule out future opportunities for a possible trades that might be successful trades in the futue,In any case it should not cause losses but rather the opposite. Just showing you another option,and I'm still testing my theory and i want everyone to see. The advantages and disadvantages of each method are clear to everyone. A realistic EA would not be allowed to take decision on these two ticks, but your EAs do and so perform better that would in reality. How can you say that again after i show you a back test with every tick? Only the trade entry is based on the open price of a candle not the trailing stop. The results are fine and so are all the others. I also make an effort to introduce tests with each tick in all other EAs. Please explain why did you insist and say that my EAs do not work in reality when i show you a back test with every tick ? This is an unnecessary libel. I am one step away from complaining about you Because you lie repeatedly without proof! This EA is a tester fake. It is not for real trading. EA uses onTimer event and peeps into OHLC ticks. High and Low of M1... got it? EA uses IsNewBar only for got Open tick. I am posting this in the hope that some readers will recognize how careful OHLC testing mode needs to be handled. I do not intend to fuel any rage about this issue.